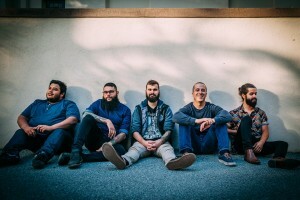 Redwood City, CA founded Sea in the Sky unleash their 10 track album entitled ‘Everything All At Once‘ onto the world to provide a bit of heavy, melodic, and whatever can fit in between. Created in 2012, Sea In the Sky are currently a 5 man band that stretch out their musical knowledge and bring forth many flavors of music into one spot. In our reviews we generally use lots of words to describe how good something is, that’s the nature of being a journalist we have to make it wordy and long so you have something nice to read! In doing this, I’ve found many talking points to talk about from ‘Everything All At Once‘. The title track for instance ‘Everything All At Once‘ is the last track on the album that displays all the elements of airy rock vocals and heavy but articulated guitar riffs without going overboard and being too heavy if that makes sense. Vocally it’s a very melodic song and a strong showing for the band. Pale Blue Dot being the second track is big humdrum for me in the terms of it feels droning vocally but musically is very solid and pleasant. It’s a 50/50 for me but definitely worth a listen for you to interpret for yourself. Not Too Tall, Not Too Cool is the leading single for the album and one of my personal favorites as it displays the bass players[Johan Guerra] prowess and presence as the bass is funky and got a little bit of fuzz so you know it’s more than just a bass padding. Vocally the approach if very well done and so nice to hear a harmony of voices in the chorus and pre-chorus that setup a nice atmosphere. To put it in a word picture imagine yourself in a field near that overlooks the ocean and how the wind and water seem to make that nice harmonic balance. The breakdown continues this vibe but brings the bass to front of the line to create a nice little solo. Well done guys on this one. An Appeal to Emotion is a track that goes for the mellow vibe and presents a droning drum line that shows some endurance and timing, again the bass is wonderfully introduced but a bit driven back so the singing can take over and present the lyrical word picture of feelings and holding on to hope. Overall a really mellow and interesting song to consider in the arrangement. For those unfamiliar and may need a reference, the press release for the album said for fans of CHON which is a djent influenced band that is mainly instrumental but known for their amazing technique and jazz sounding guitars that create a intricate sound experience. One thing I rarely mention in a review is the artwork. ‘Everything All At Once‘ has a beautiful cartoon backdrop of a astronaut exploring a new world with a flag in hand to maybe mark where he’s been or where he will be going. I love sci fi backdrops and art direction mixed with what feels like a 90s drawing. So well done to the person who made this masterpiece! From the outer appearance to the inner contents of the album, there a few tracks that felt like padding and a bit of droning but the ones that stood out showed a great promise and diversity of bass and guitars alongside the percussion section that from the favorable to the lass favorable song, the drums are prominent in keeping pacing with whatever is going on. 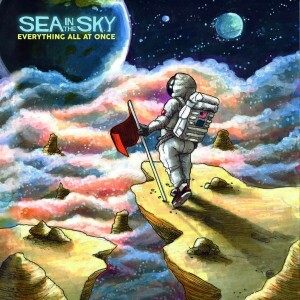 ‘Everything All At Once‘ by Sea In The Sky is a fun ride. From the first track to last it’s a nice airy escape vocally, and a very impressive complex touch instrumental-wise. With a few more listened to go after this article, I could see it easily being in a top 2017 list for albums. With all that said do yourself a favor and listen to one or two tracks and you will see easily how it feels different and for good reason. Sea in The Sky put great attention to detail into this project so show some love and see you on the next article! All, Alternative, At, CHON, Contrast CTRL, Everything, Feature, Music, Once, Review, Rock, Sea In The Sky. Bookmark.